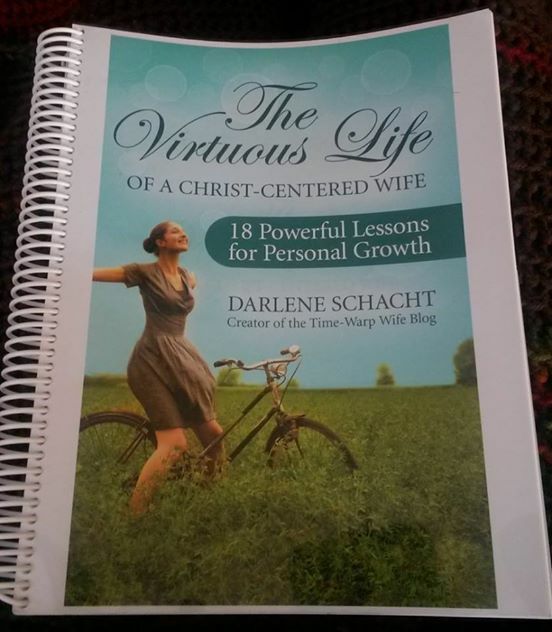 Today is the start of my nine week journey through the book, The Virtuous Life of a Christ-Centered Wife, with the author Darlene Schacht and almost 500 women from around the world. Darlene is also known as the Time Warp Wife to many of us. I was first drawn to Darlene’s style of writing when I accidentally stumbled across her website: http://www.timewarpwife.com. The website is “filled to the brim” with godly advice on how to become a better wife and friend to your husband, as well as many FREE e-books and printables. So grab your cup of coffee and check it out!!! You won’t be disappointed. Now on to Darlene’s latest book…The Virtuous Life… Lesson One: What is Virtue? Darlene shared with us in today’s lesson that her daughter recently took up running. The more Madison exercised her muscles, the easier running became and the more she enjoyed it. Darlene assured us, that in the same way, if we exercised the virtues of patience, and self control the easier it will get for us. I was a little skeptical, but I thought, what do I have to lose, so I gave it a try. Hey! Darlene was right. After four days of exercising the virtues of self control, patience, kindness, and love, I saw a tiny bit of transformation start to happen. When I make the conscious effort, to bring my flesh under the authority of the Spirit, this is when real change occurs. A few questions popped into my mind. 1. Am I willing, right now…to be transformed by the renewing of my mind, choosing… to no longer be conformed to the pattern of this world? 2. Am I willing to exercise, on a daily basis, the virtues that are laid out before me in this book? These next nine weeks will consist of beating-back the “Desires of the Flesh,” for the glory of God. Not an easy assignment to say the least, but I am confident in knowing, that the transformation to holiness is a slow and steady process. I must not be discouraged. I love what A.I. Strong writes in The Complete Green Letters. I don’t know about you, but I’d rather be in oak tree for Christ, then a squash any day. God is transforming us….from eternity and for eternity, virtue by virtue. We’ll continue our discussion on lesson one tomorrow. Thank you so much. I am looking forward to the weeks ahead.